I had the honour to have my words appear in the latest edition of acclaimed food and wine magazine Noble Rot. Have a read below and find out more about this stellar publication and wine bar here. When I was idly daydreaming on a beach in Rio de Janeiro, after completing a two and half year bicycle ride researching food across the Americas, I sketched out a picture of what I felt my dream building might look like for the gourmet cycle lodge I was planning in France. Six years later I was standing in front of the same building on a bright autumn day in Auxey-Duresses, a village surrounded by vines in the heart of the Cote d'Or. After touring the house and gardens, the eager estate agent led me across a tiny road and exclaimed, 'It even has a pizza oven'. Three years have passed since the initial excitement of turning the rusty key and entering the cobweb-draped bakehouse, with its date 1798 carved over the door, and opening the creaking iron door of the oven. Moulin Prunier is now home. The Mill House has been renovated, and in the last few months my attention has turned to the restoration of the historic oven. It soon became apparent that this was no pizza oven, but a post-Revolutionary four a pain, with its domed roof made up of diminishing concentric circles of blackened bricks. The oven seemed more and more like an unexpected, and unasked for, gift and my cook's imagination fast-forwarded to sweet-smelling rows of traditional golden loaves emerging from its glowing depths. My ethos at The Hungry Cyclist's Lodge is to prepare natural food from local, seasonal produce, much of it from my own garden and orchard, in the great French tradition of enhancing simple ingredients to create a sublimely flavoured meal. Home-made bread from a traditional oven complemented my vision perfectly. Local ingredients were used in the creation of the oven itself. The bakehouse of limestone has a chimney lined with tufa calcaire, a material found in the veins that run through Burgundian limestone and known for its thermal conductivity, which made it an optimal choice for Roman bathhouses. The bricks used for the oven came from the Bresse area in the south east of Burgundy, a region also famed for its chickens, and smooth refractory bricks covered the sole or floor of the oven. The upper storey of the bakehouse was used for storing and drying the faggots with which the oven was lit, as well as fruit from the Moulin Prunier's orchard. It was not only the idea of baking authentic bread in the old way which appealed to me, but the history of the bakehouse itself proved integral to the wider history of eighteenth century France. The date 1798 was deeply significant, although the mill itself had been built in 1629, one of a dozen in the valley which runs east from St. Romain through to Meursault. The laws of feudal France, the droits de seigneur, decreed that villagers must, for a tax known as a banalite, use the four banal or Lord's oven to bake their bread, the same laws extending to the use of granaries, wine presses and even male pigs and bullocks for breeding. It was also decreed that bakehouses must be in separate buildings from dwelling houses, since the risk of fire was ever present, particularly in villages which often consisted of little more than hovels, a factor successfully manipulated by the aristocracy.. Marie-Antoinette's haughty pronouncement of 'Let them Eat Cake' when bread supplies in Paris ran out due to poor harvests and grain speculation, was a disdainful comment on the staple diet of the poor. Little wonder that in 1793 the post-revolutionary Government passed laws allowing every village to erect its own communal bakehouse. It was just five years later that the free-standing bakehouse in Auxey-Duresses was built. A Meursault barrel-maker and expert in all things 'four', had pronounced cheerfully after inspecting the oven 'Vous avez chance. C'est en bon état', but the restoration was not without its problems. After pulling up the original pine floor boards the old oak beams had to be sprayed to eradicate the termites, which had munched happily for decades. Days passed painstakingly chipping away at the chalk and exterior mortar joints of the chimney before reapplying the traditional mix to ensure the flue was sealed. Countless claustrophobic afternoons were spent belly-up in the tomb-like oven, masked and goggled, picking away the pointing between the soot-blackened bricks. 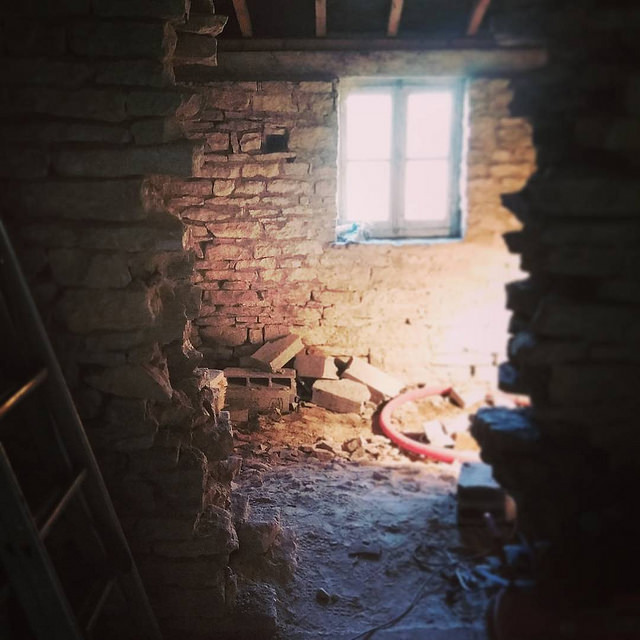 In the coming months, when the weather is dry, these will be repointed before the sole is levelled with sand and relaid with refractory tiles to ensure a regular baking surface. The four can then be fired for the first time in over sixty years. This doesn't mean I won’t make the regular pilgrimage to the bakery in Meursault. The French still make wonderful bread, but nothing compares to the method, smell and flavour of baking bread at home; the nurturing of natural sourdough starters; late nights meditatively kneading dough, the unmistakable fragrance that fills the house. But with my nearly restored oven beckoning from across the road, my thermostat-controlled electric cooker now appears to have its limitations. A traditional oven is a different beast altogether. As well as large amounts of dough being prepared, wood for faggots needs to be selected and chopped. Once lit, the fire has to be tended and meticulous care is needed to measure and manage the precious falling heat trapped in the mass of the bricks, but it’s not only bread the oven will bake. Grateful for this unexpected resource, my mind regularly turns to summer feasts for my guests. Glistening haunches of roasted boar from the ancient forests behind the house, washed down with a robust Auxey-Duresses; dense terrines of mottled rabbit and liver, eaten with cornichons, home-baked bread and and a crisp Saint Romain; roasted Poulet de Bresse, its golden skin stuffed with butter and garden herbs, enjoyed with a sprightly Pinot Noir from Monthelie; and glistening tarts jewelled with amber mirabelles from my orchard. But we are living in the 21st century, and it would be a crime not to fulfil the estate agent’s promise of a slice of pizza maison with a cold pression by the pool after a good day’s cycling.